Carpet Edge Sealing Tip for left hand use with standard carpets. These patented tips allow carpet edges to be sealed with any hot melt glue compatible with carpet backings. Now you can better and more easily seal edges and also eliminate time lost waiting for latex glue to dry. The No. 3630 Adapter Valve with Lock Nut (or an equivalent) is usually required to attach the 4 Series Tips to a glue gun. Carpet Edge Sealing Tip for left hand use with standard carpets. These patented tips allow carpet edges to be sealed with any hot melt glue compatible with carpet backings. Now you can better and more easily seal edges and also eliminate time lost waiting for latex glue to dry. The unique design of these tips assures excess glue is directed onto the backing of the carpet, and not into the pile. With a little practice, you will be able to quickly and completely seal carpet edges from a standing position without looking directly at the cut edge. All three tips function the same as the Plenum area fills with pressurized glue, which is then forced onto the carpet edge. The Relief area allows excess glue to vent to the carpet backing. This sealing method complies with CRI 105 - 2002 Standard for Installation of Residential Carpet of The Carpet and Rug Institute. All three tips have 3/8"-16 internal threads and are 1/2" diameter x 1-1/4" long. The No. 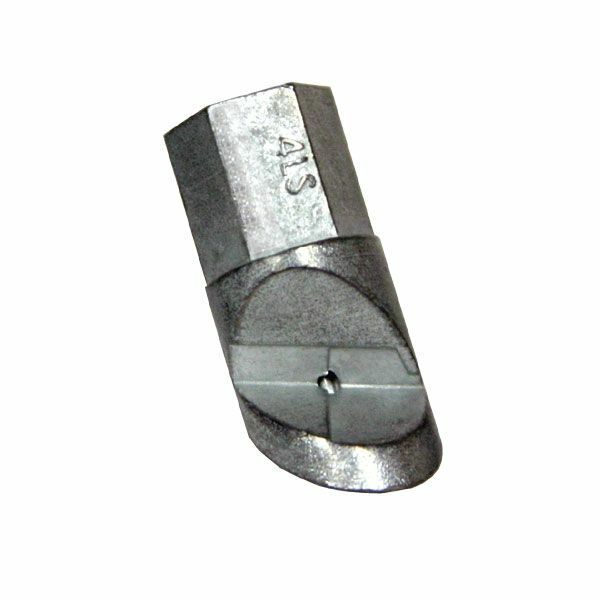 3630 Adapter Valve with Lock Nut (or an equivalent) is usually required to attach the 4 Series Tips to a glue gun. No. 3630 Adapter Valve with Lock Nut sold separately.